Saffron Fields Vineyard, the winery created by Sanjeev Lahoti and Angela Summers, will be featured at this summer’s International Pinor Noir Celebration in McMinnville, Ore. IN THE FOOTHILLS of the Coast Range lies the heart of Oregon wine country, an area where growing, and crafting, great pinot noir melds dreams and history. Two chemical engineers, Sanjeev Lahoti and Angela Summers, are building a second career after falling in love with wine during a trip to California’s Napa Valley. Sanjeev grew up in Mumbai, India, and Angela in Mississippi, meeting more than 20 years ago in graduate school at the University of Alabama. After scouring the Northwest for the right location for their project, they came upon this land in western Oregon near the town of Yamhill, which combines a deep history with a sense of sought-after serenity. In 2004, they bought 90 acres that were part of a 1930s timber empire. Douglas fir planks were repurposed from the original dairy farm’s barn into the magnificent, airy and art-filled tasting room of Saffron Fields Vineyard. 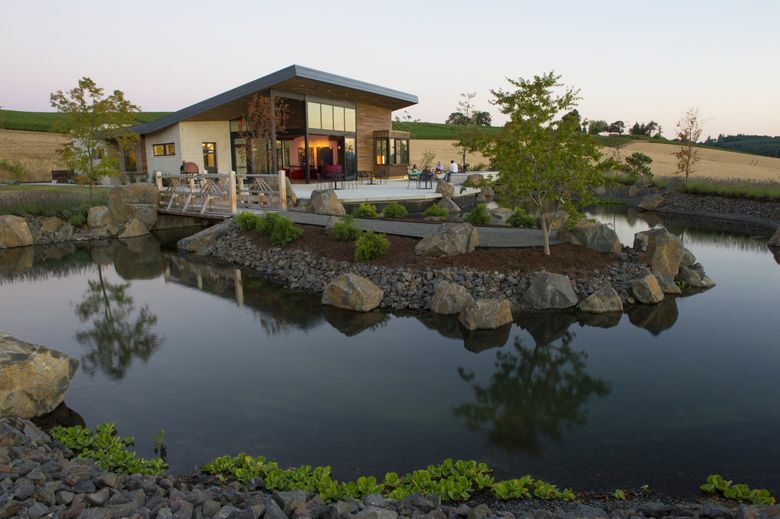 It now is surrounded by 32 acres of pinot noir and 3 acres of chardonnay, which go into producing a dozen different bottlings of estate wines. The winery’s name is a nod to Lahoti’s memories of India. Ask for these at your favorite wine shop, or contact the winery directly. Saffron Fields Vineyard 2014 Heritage Clones pinot noir, Yamhill-Carlton, $50: A classic Oregon pinot noir, thanks to aromas of cranberry, raspberry and potting soil. Ripe, plush flavors of beautiful red fruit and hints of cola, all backed by smooth, pliable tannins. Saffron Fields Vineyard 2014 Expressionism pinot noir, Yamhill-Carlton, $80: This big, jammy, stylish pinot opens with aromas of chocolate shavings, ripe plum and moist earth, followed by flavors of ripe Bing cherries, orange zest and ripe strawberries. Saffron Fields Vineyard 2014 pinot noir, Yamhill-Carlton, $55: A classic Yamhill-Carlton pinot, with big, dark tones; firm tannins; and notes of sweet herbs, clove, nutmeg, chutney and a whisper of cherry cola on the long finish. The wines are crafted by Tony Rynders, who is one of Oregon’s most recognized winemakers. The couple met Rynders at Oregon’s annual International Pinot Noir Celebration and struck up a conversation about the vineyard they were planting. Rynders quickly recognized that this site could produce grapes that were classic to the region — blue and black flavors, firm tannins — resulting in wines of distinction. When the vineyard approached its first harvest in 2010, Rynders inquired about buying grapes, and that led to him becoming the consulting winemaker. It has come full circle, as Saffron Fields is one of the featured wineries at this summer’s International Pinot Noir Celebration, July 27-30, on the campus of Linfield College in McMinnville. Hundreds of wine lovers will mingle with pinot noir producers from around the world in a series of dinners, seminars and tastings, culminating in a fabulous outdoor salmon bake. If you love Northwest wine, IPNC should be on your bucket list of must-do events. Tickets go quickly, so act soon.